Ever take one of those personality tests and think, that is not who I am? Tests are taken between grade school, job interviews, and ‘self-improvement’ conferences supposedly determining your inner make-up. Despite every test indicating I was an ‘introvert’ I opted to ignore the test results. 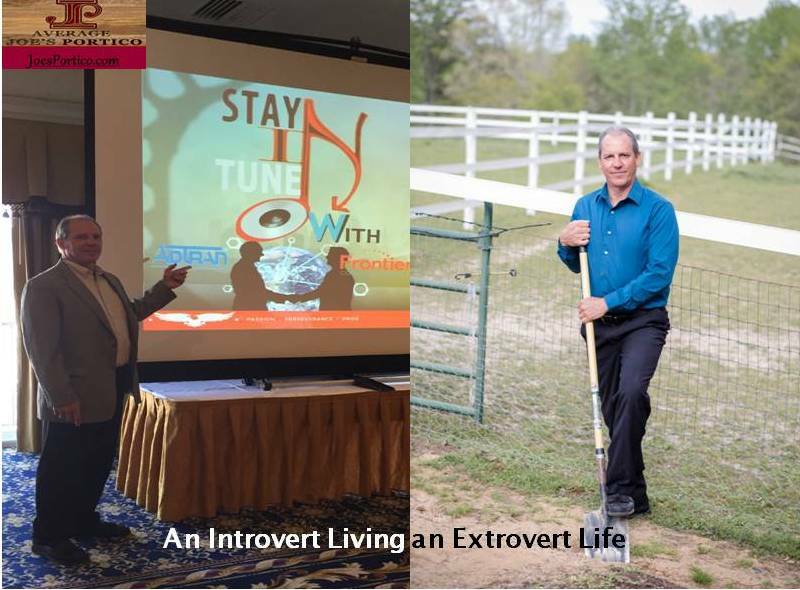 Somehow, for the past thirty+ years, I became An Introvert Living an Extrovert Life. In middle school, I was good at math, horrible in the sciences, ok in writing, and personality wise – completely afraid of people. As test after test said I should be an Accountant or later a computer programmer, I began to dread my future. I marveled at the outgoing types and envied their ability to talk, be athletic, and spout out jokes off the top of their heads. In a comfortable environment, I could be them, but I needed time to process my thoughts before saying a word, especially in front of crowds. I dreaded being called on in the classroom. I can almost feel my ears and face on fire as I click the keyboard just remembering those days in middle school when the teacher said, ‘Joe, joe, joe, joe what is..? I’d freeze up and saying nothing, wishing I were dead. Even though I knew the answer, the fear of being wrong was so overwhelming. I would blank out or say the first thing that came to my mind to end the torture. If it turned out to be wrong, I would melt under the desk. That, I believe, validated me as an introvert. If you need help putting together a swing-set, call someone besides me. Zero! My ‘honestly answered’ tests showed the mind of an introvert but, I knew they did not measure the heart and my cares for people portion. The shyness mode seemed to offset the caring mode, I guess. More advanced tests measure passion. Do you want a job in management or sales, just answer all the ‘I love to be around crowds’ questions with the highest number and lo and behold, you can fake yourself into being a manager. Therefore, I passed the Army exams and go accepted on the path career in criminal investigation. Unfortunately, a bad experience with the justice system turned me off, and eventually I reverted back to the test results. I earned a degree in none other than computer programming. Only three weeks into my first programming job ever, I discovered the tests were completely wrong. Sitting still at a desk all day long writing code was not the box I wanted to live in forever. The tests did not measure sitting still ability, I guess today that would be called ADHD. I found I had much pent-up nervousness and needed to be moving, always. Goodbye degree I thought as I went from a programmer of computer software to selling it. However, when the first sale hit, and the first commission check arrived I was ready to shelf the degree. Nice! Company one, however, went bankrupt and that large commission check, gulp, bounced! Amazingly companies two, three, and four also fell apart, I was starting to get a complex. I settled back in a safer technical salary role with Company five. It was a box-you-in type role that I hated. At that stage, I was married with our first child, and we had a good side business, but we were broke, and my confidence was crushed, the bottom had hit. we were broke, and my confidence was crushed, the bottom had hit. The saying ‘things happen for a reason’ is one that is so true. Hitting bottom opened a choice to evaluate which box I wanted to live in. Aside from the job failures, I felt like I was failing as a Father and my other passion, to be in church ministry had also crumbled (which I will cover later in the Portico). Other than making un-educated employer decisions, I was puzzled why everything was falling apart. That old anxiety issue started finding its way back in the mind. A close church friend was working in an industry I had never heard of called telecom. He set me up with an interview (and provided a great reference). I was told the personality tests meant everything in their interview process. Thus I answered the questions to fit the role checking off how I love everything about people. When the job offer came in, I was negatively shocked, as my friend had not told me I would be taking a pay cut. 10% salary, 90% commission. But the 90% sure looked good, although I knew it meant, high risk – I could make $zero. With my wife strongly showing confidence in me, we took the risk. In one year our measly broke pay multiplied. Fifteen years later on a stage in front of hundreds the VP of Company seven (I stayed with #6 12 years, he and I both moved to the same place) described my interview with him; ‘When Joe came to my office 16 years ago, I was last in a long line of interviewers. We talked for a while, and I saw all his fidgeting and wondered how, did he make it this far? As he got up to leave, I noticed he had completely shredded a napkin during the interview. Nervously torn napkin pieces covered his pants and jacket. I shook my head in wonderment at how desperate we had to be to want to hire this guy’. He went on to say, as he handed me the Salesman of the Year plaque, ‘here stands an example of what hard work and overcoming fears can become.’ While I have had some great moments (of course some not-so-great ones) in my career, that was the proudest moment. Some people are motivated by pats on the back, my first good boss Jerry was great at that. Some are motivated via having doubt from others flaunted at them, I found I was oddly motivated by both methods. As I look back, I wondered why I did not fit on the personality type charts, yet I was able to overcome my own internal doubts, and won? Another fifteen years later and a few more plaques in-between I sat this morning researching the topic of ‘introverts living like extroverts’. One mentioned the topic of self-awareness, which I agree to its importance in knowing your weaknesses and avoiding them (things like putting together swing sets). Another listed the nine telltale signs of when being an extroverted introvert is harming you. If you’d like to increase the number of questions you have about yourself check out the loner wolf’s view on the topic. Another article evaluated the science of the mind and how it relates to introverts, extroverts and the middle spot – an ambivert. In this end, I have yet to pinpoint where I fit on the charts but one thing I know for sure; I’d rather be working in a garden than standing in front of people. But gardening typically does not pay the bills, yet it provides much solitude, stress relief, and good health. I often have pondered and experimented with finding a balance to manage inner turmoil we average introvert people experience. Thus the conclusion has led me to think all the crazy experiences of this life have led me to fulfill a calling. One of passing on the secrets to those who cannot afford to pay a mind therapist, health therapist, calm therapist, financial advisor (which brings needed security), business advisor, gardener, and a host of other helpers. Thus, today’s mini-story is to set my sales career behind, completely. I am switching to full-time writer to help the doubting and fearing average Joe’s of the world to find inner peace. For some, this is new news as I walk from the turmoil of the business world to of all things, writing. It has been a great journey, and I have had many awesome relationships established that I hope to continue from a new perspective. In the marketplace, I pondered how to provide business solutions while sitting on my porch (aka ‘Portico’) at home. Those creative ideas and problem-solving thoughts were brought to the business table in practical and easy to understand terms. Likewise, the goal of Average Joe’s Portico is to help the individuals who struggle with worry, anger, depression and other thought issues, to creatively be led to finding peace and calm. It is not completely new. In the past two-years, 70+ mini-stories have been written with more to come. The difference now is I can be less discreet on the additional area that set up this calling. For me, this is by no means easy. I hate talking about myself, especially as I oft feel the need for full disclosure for things like my anxieties. In all honesty, while I was proud to win a few plaques, I would have preferred having it mentioned in an email and mail the trophy. Introverts supposedly crave ‘being liked’. They hate being the center of attention. Perhaps I am truly an Introvert living an Extrovert Life? With that out-of-the-way, I write to two audiences but offer the opportunity to tie them together. The body and mind need much care to return to or remain in security and calmness. Additionally, for this Average Joe, I believe without the Spiritual, all else although helpful, would fall short. But to those who are skeptical, there is no forcing you to hear or read the Spiritual side so you can stop now. But I do softly urge you to surge into Joe’s Portico and hear the other side of the story…. So what is this calling thing? In reality, I believe every person who has entered a relationship with God has a calling. Jesus very first converts were called to ‘fish’ for people as He said to Peter and his brother Andrew, average every day, uneducated fishermen, ‘Follow Me and I will make you fishers of men.’ That is a calling. It is important to understand the word, ‘begun’. Just as a baby is born anew, it does not come out jogging. It learns to crawl before walking and before jogging. Many Christians do not grow out of their problems because they do not make the concerted effort to exercise and work on the muscles that need the workout. That is why churches, books, blogs, and other entities are needed. I thank God I over time have changed in some ways, but there is still a long way to go for me, and for whoever may be reading this now. If there is a deeply ingrained issue, it takes time to tackle and defeat it completely. Second, everyone has a hidden motive of some kind, do they not? Wrong, I do not have one here, believe it or not. This is a pay-it-back mission. My only hitch to this web-page is an ad or two and reviews of books and music I like. Click an ad or buy a book or something from Amazon and pennies go in an account to help pay the internet bill, thanks. Otherwise, I do have a couple of books I plan to finish and sell someday, now that I will have the time to finish them. ‘Still, I want it made clear that I’ve never gotten anything out of this for myself, and that I’m not writing now to get something. I’d rather die than give anyone ammunition to discredit me or impugn my motives. If I proclaim the Message, it’s not to get something out of it for myself. I’m compelled to do it, and doomed if I don’t! If this was my own idea of just another way to make a living, I’d expect some pay. But since it’s not my idea but something solemnly entrusted to me, why would I expect to get paid? So am I getting anything out of it? Yes, as a matter of fact: the pleasure of proclaiming the Message at no cost to you. You don’t even have to pay my expenses! Even though I am free of the demands and expectations of everyone, I have voluntarily become a servant to any and all in order to reach a wide range of people: religious, nonreligious, meticulous moralists, loose-living immoralists, the defeated, the demoralized—whoever. 1 Corinthians 9:15-20 (From The MSG version) -note I did not make that up, see it for yourself if you don’t believe it. Q. – So Joe, what happened then to the calling you supposedly had 36 years ago, why only now? Remember how I said some things happen for a reason, we all use that line when we do not know what in the world is going on, but are fighting doubt to the maximum. My first calling was short-circuited by allowing myself to follow people’s lead and not God alone. The Bible is filled with stories about imperfect decisions made by the followers of God. In fact, most of the stories are about people messing up and God coming to the rescue. The secret is to avoid allowing people to get to you so badly that it takes you away from a loving God. You can read how that happened to me, and the wrong turns I took both in the business world and church world. A major portion of my writing is and will continue to be what-not-to-do, accompanied by the lessons others and I learned the hard way. Hopefully all, but not every, ended in a better way. My original calling was to enter into what most deem full-time ministry. I, like many others, have learned ministry is more than the one person on stage in a church or a missionary going off to Haiti. Ministry is taking what we have in our one-on-one relationship with God and passing it on to our family, friends, and co-workers way before we tell a stranger. It is living, loving, forgiving, and pointing people to God. Jesus set the pace when it was said of Him in John 2:23-24 “During the time He was in Jerusalem, those days of the Passover Feast, many people noticed the signs he was displaying and, seeing they pointed straight to God, they entrusted their lives to him.” My job I believe is to point people to Him, not me, in any positive way I can. Although I would like for people to follow me on Facebook, Instagram or wherever, the One to truly follow is Jesus, not I. My Average Joe calling is not much different from that of Billy Graham, the Pope, (other than a bit smaller scale) or any other believer. This is nothing extra special, other than walking away from a good job. Thus, I have penned the name Average Joe, not to be clever, haha, but to avoid taking credit for anything. I only tell of my successes on the job because I know what a klutz and blubbering fool I was. God got a hold of my life, soothed the introvert tendencies, and showed me how to live an extrovert life, for His sake. True story, my beginning sales skills were obtained on college campuses knocking on dorm doors talking about Jesus. That may be a shocker for some, as maybe we never had the chance to talk on a personal level. I can assure you though, having had a glass of beer dumped on my head versus selling routers and switches is way easier in comparison. It was better than any Dale Carnegie or Tommy Hopkins training class (of which I took several courses). It was God getting a hold of me that has turned being a shy afraid to pick up the phone sales person and turned me into a person willing to slap my picture on the internet and talk about how Jesus changed my life. Believe me, that has never been easy and even now I feel some reluctance to hit the post button. When you have a calling and blow it, and then are given multiple chances to get it right, I think it is wise to take it. You never know if that chance will be offered again. Thanks for reading the stories of my life brought to you by a God much bigger and better than me. May all that I do point to Him. This is a Spirit-filled life, not just An Introvert Living an Extrovert Life. It has taken me 37 years to understand and I learn more each day. If you would like to be notified of future postings, please submit your email address and I loved to hear your feedback. Or start a conversation with others via the Reply/comment section (not ‘feedback’). This topic is certainly one I hope has created debate in your own mind, no matter where you stand on the topic. Please feel free to comment and share your take. I so ralate to this, thanks for being willing to confess what goes on in your head. You are Portico Joe…not Joe Portico.. You were ALWAYS the best! !